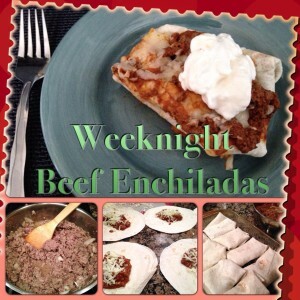 Years ago I came across a recipe from Southern Living for Weeknight Enchiladas. They were absolutely amazing and it has been my go-to recipe ever since. Give them a try and I’m sure they’ll be on your favorite list too! Cook beef and onion in a large skillet over medium-high heat until meat is browned, stirring until it crumbles. Drain and return to skillet. Stir soup and enchilada sauce into meat mixture. Spread 1/4 cup meat mixture onto each tortillas; sprinkle tortillas evenly with 1 cup cheese. Roll up tortillas and place seam-side down in a greased 9×13 baking dish. Pour remaining meat mixture over tortillas. Cover and bake at 350 degrees for 20 minutes. Uncover and sprinkle with remaining 1 cup cheese, bake 5 more minutes or until cheese melts. If desired serve with sour cream, guacamole, rice and/or refried beans! Cover with sealable plastice wrap directly against the top of the enchiladas. Wrap with heavy-duty aluminum foil. If using a foil pan, I like to wrap a couple times. If using a reusable glass dish, place lid on over foil. Before baking, remove lid, foil and plastic wrap. Then recover with foil. To bake thawed: Thaw in the refrigerator overnight. Let stand at room temperature for 30 minutes. Bake as directed above. To bake frozen: Bake 1 hour. This entry was posted in Recipes and tagged beef enchiladas, southern living weeknight enchiladas, weeknight dinner. Bookmark the permalink.